intertwined with the sport itself. Omega was there at the beginning of the sport in England, before splitting into Western and powerhouse builder, Cameron. Don Cameron worked for the Bristol Aeroplane Company when he, along with a few friends, members of the Bristol Gliding Club, formed the group that built the first modern hot-air balloon in Western Europe. 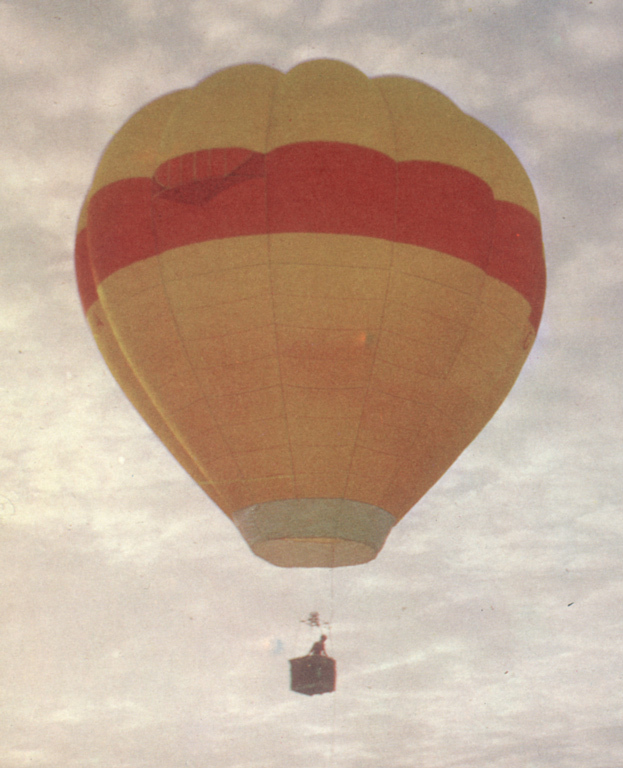 Called the "Bristol Belle," this balloon tore itself apart on its first inflation, then was rebuilt at Cameron's behest, with the addition of horizontal load tapes for structural integrity. "Bristol Belle" first flew in July, 1967. 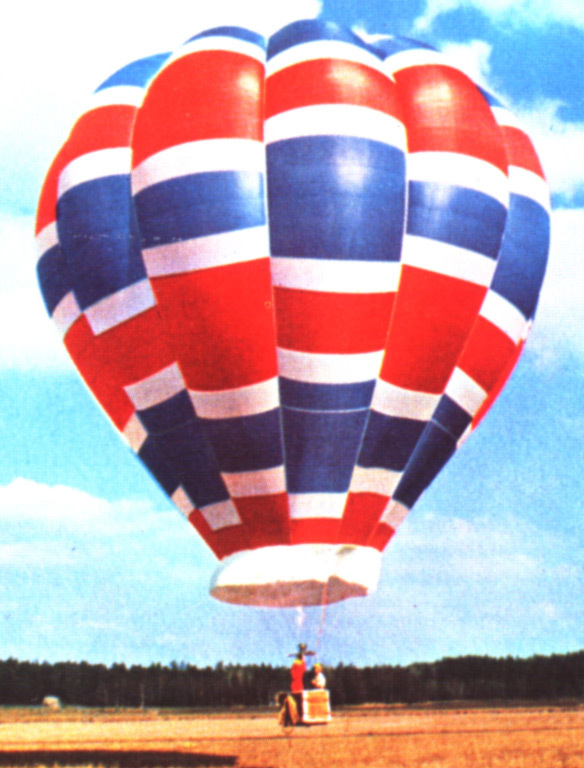 In 1968, Cameron, with Leslie Goldsmith, founded Omega Balloons. 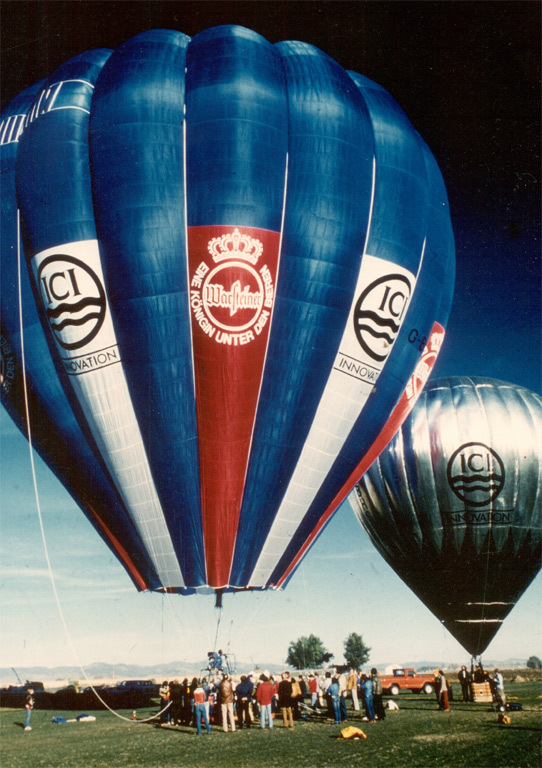 Omega built ten balloons before splitting into Cameron Balloons and Western Balloons in 1970. 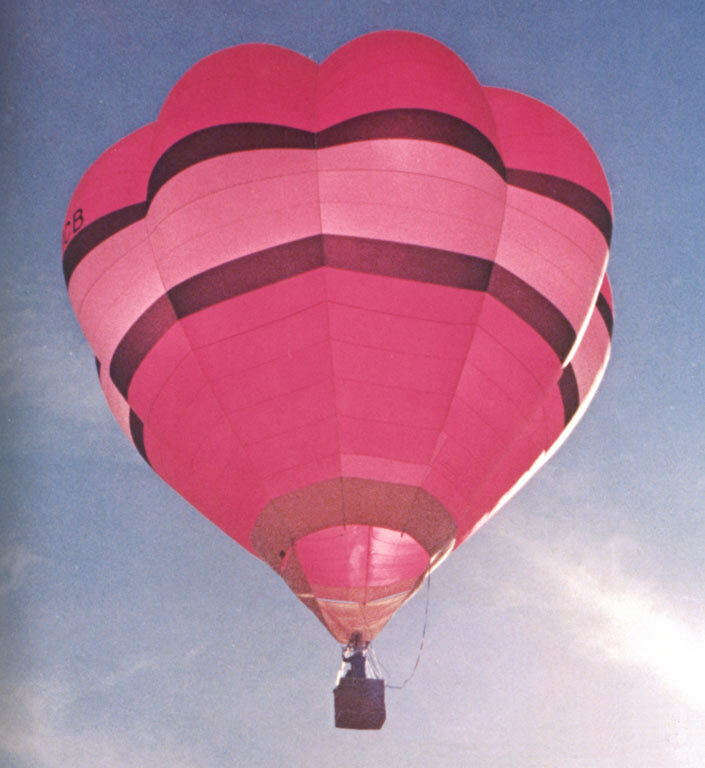 Western built some good balloons, and won over its share of fans, but never fully became a force, and, according to Don Cameron, closed up operations when Thunder entered the market in '72 - '73. 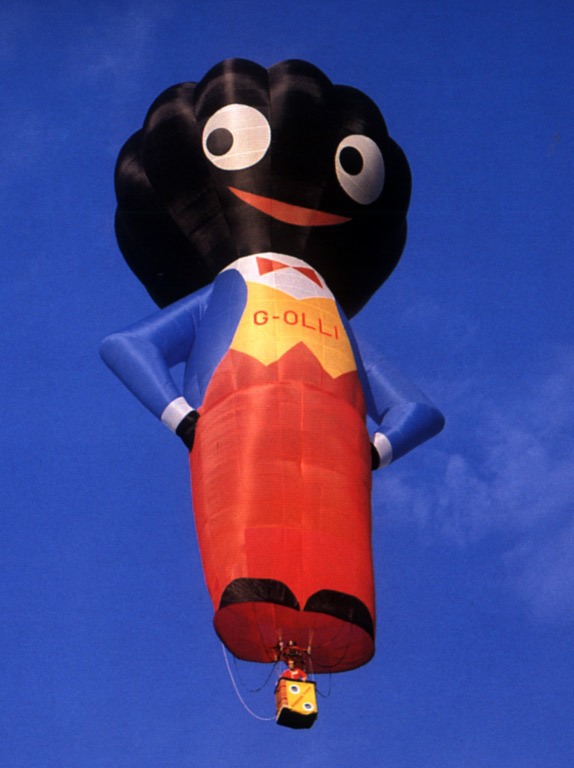 Cameron, of course, has thrived, leading the world in sport balloons and completely dominating in special shapes. 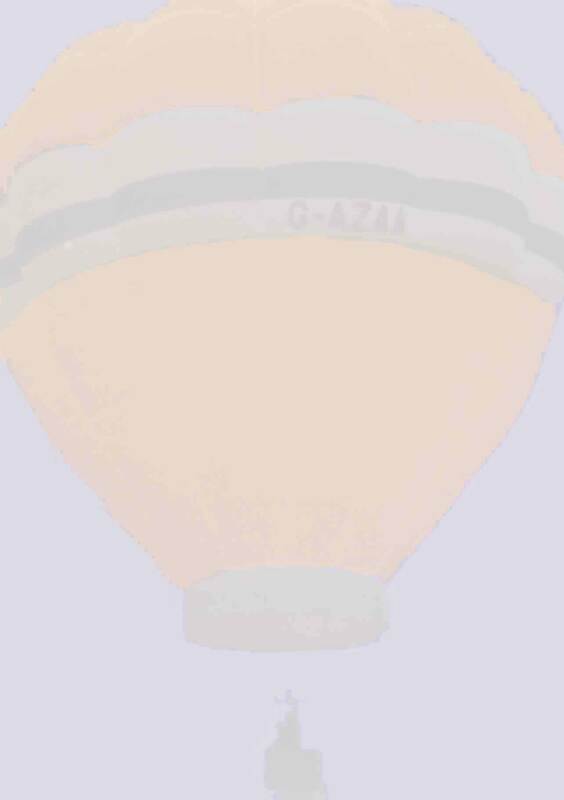 Much of the above is taken from a wonderful history of Cameron Balloons Ltd., which I've been permitted to adapt for these pages. 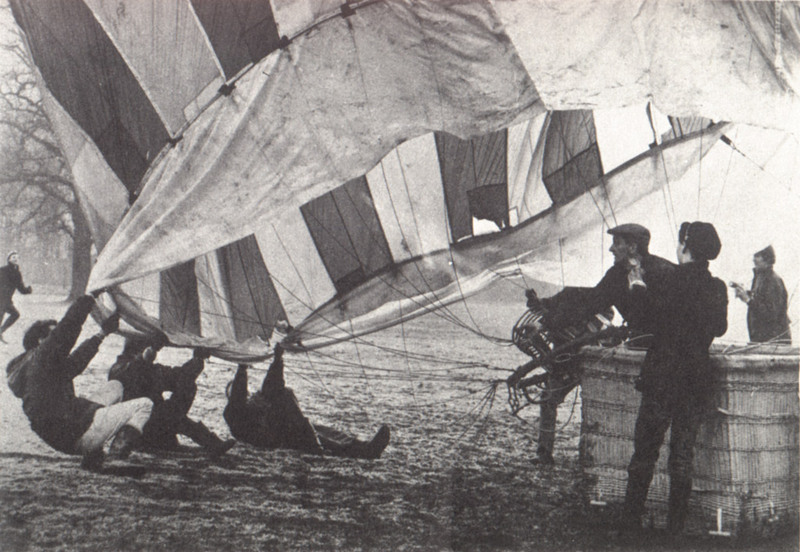 Authored by Mr. Richard Cardy, and first published in Aerostat, the magazine of the British Balloon and Airship Club, this article was kindly offered by Hannah Cameron, daughter of Don Cameron. Check it out here (set aside some time - it's a long read, and well worth it!). 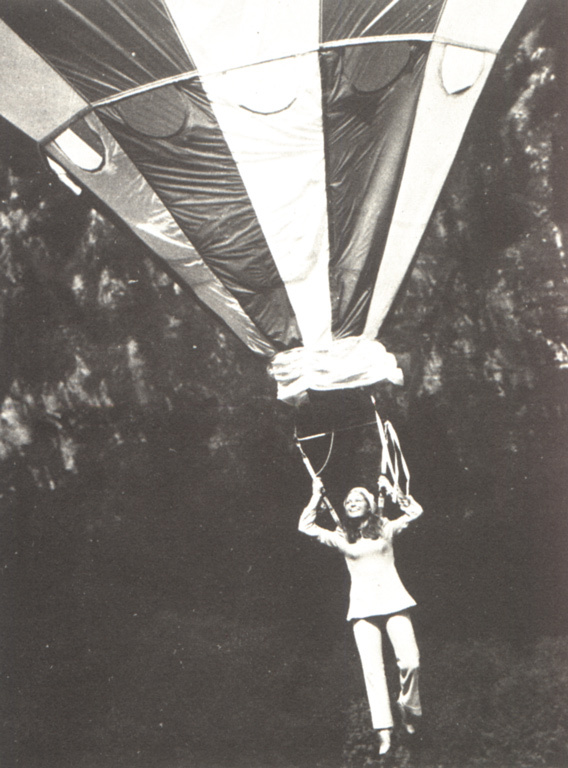 In addition to the aforementioned History of Cameron Balloons, Ltd., I've had some wonderful recent contributions, not the least of which is a beautiful set of photos featuring Don Cameron demonstrating an Omega balloon in 1969. Check them out here. I'm pleased and honored to offer these new additions, but there's still a lot I'd like to have here that I don't. If you have pictures, literature or information that would better honor Omega, Western and the early years of Cameron, please write me! Together, we're building a page that may, one day, pay fitting tribute to Don Cameron's early work. 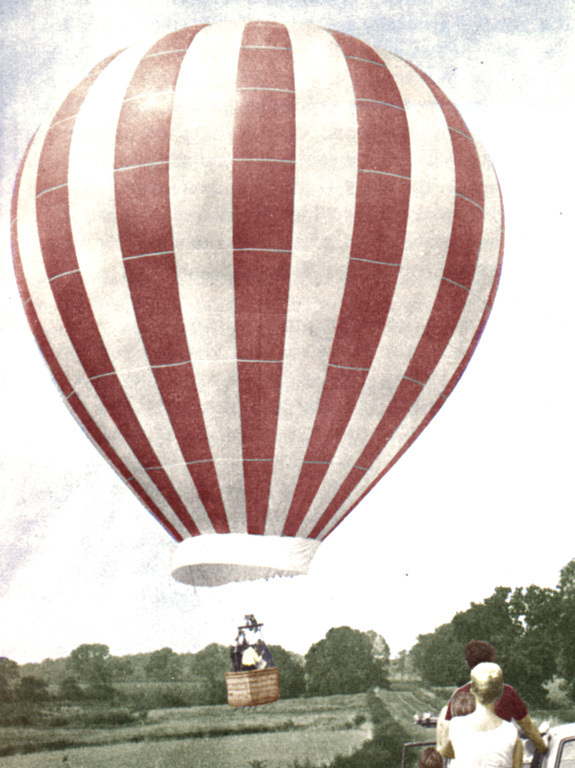 Bristol Belle, the one that started it all (spottily colorized by the author). 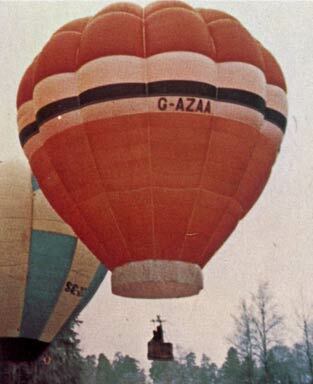 Here it is undergoing a laborious hot inflation (is that Don Cameron at the burner?). 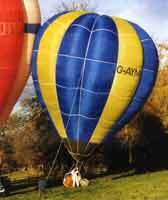 When first inflated, it tore itself apart. Don Cameron added load tapes, starting his, and Bristol Belle's storied careers. I'm pretty sure this is G-AXJA, an Omega 56 (c/n 5), first flown in July, 1969, later registered in Ireland, which it helped represent in the 1973 Worlds. 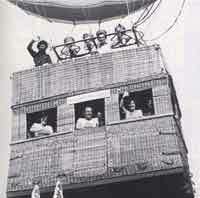 I have a great page of B+W photos of her here, on one of her first flights. 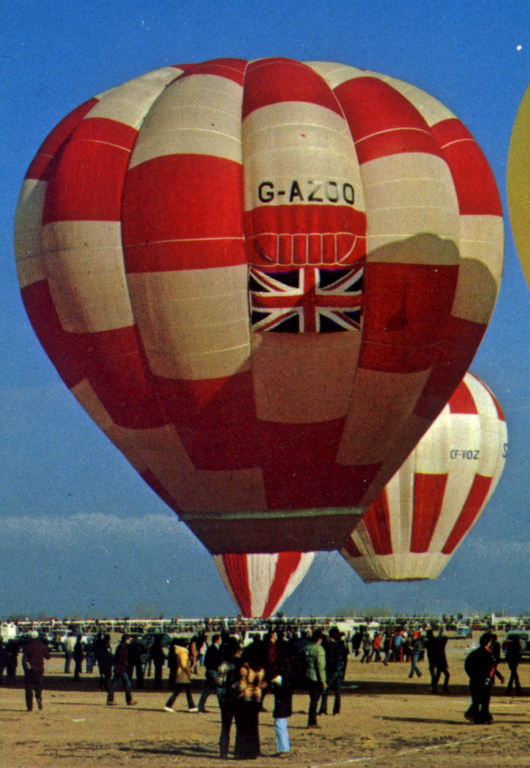 Western built just over 20 balloons between 1970 and '73, each with 12 bulbous gores. 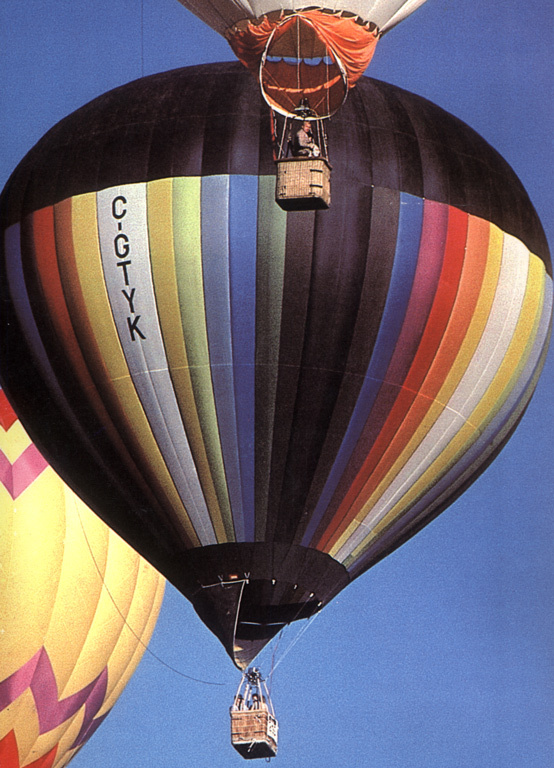 This one, like most Westerns, was a 65,000 cu. ft. model, as was this one, shown in Albuquerque, 1973, and this one. 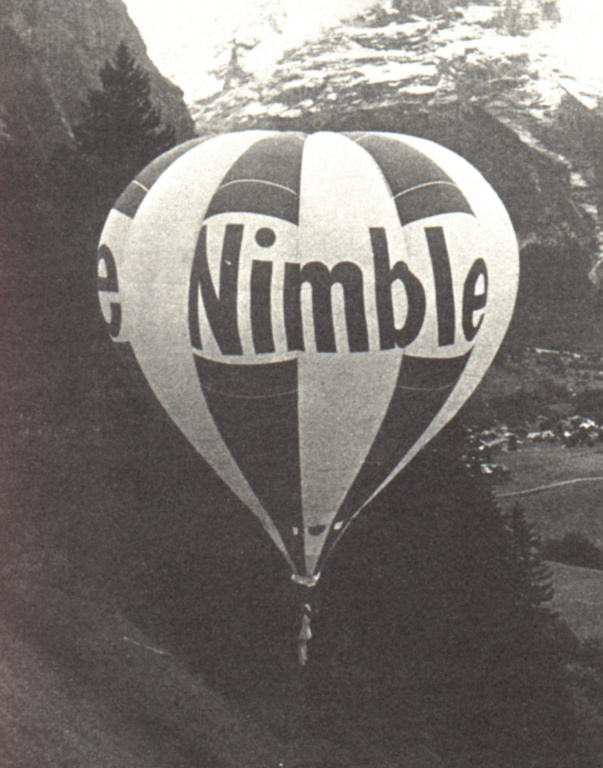 Omega's most visible commercial client was Nimble Bread. 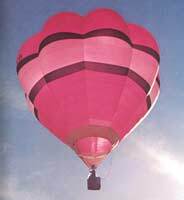 This hang balloon's intriguing shape is due to its long, sharply-tapered skirt. 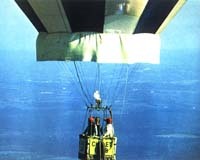 Here's a shot of the harness, with, I hear, a non-pilot model, artificially suspended. A super-short early Cameron skirt. That's a young Rick Behr at the burner of the first Cameron in the U.S. (c/n 39), flying for Buddy Bombard in 1974. 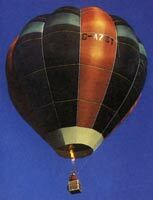 Here's another short-skirted early Cameron, c/n 35, that flew in the '73 Worlds. 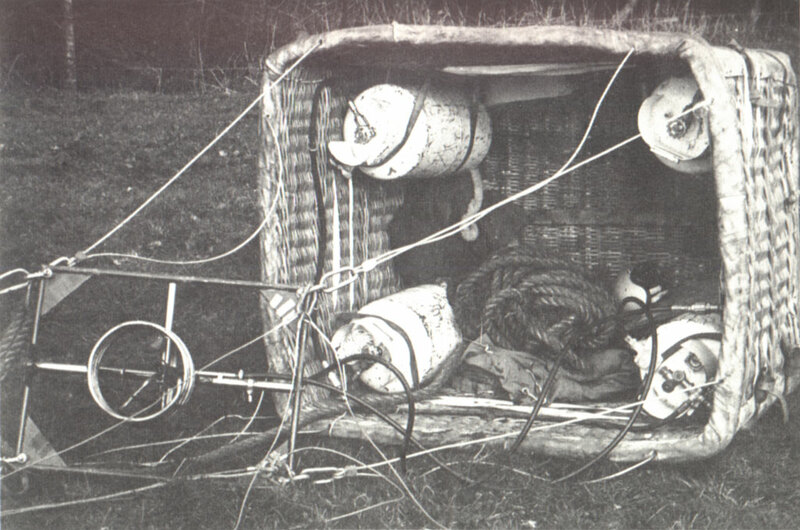 The woven-floored basket of an Omega, Henry VIII, in Milford, Surrey, early 1970. 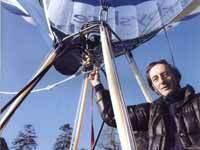 Julian Nott notes that balloonists new to hot air simply copied what was done at the time in gas balloons, such as the use of thick trail ropes. 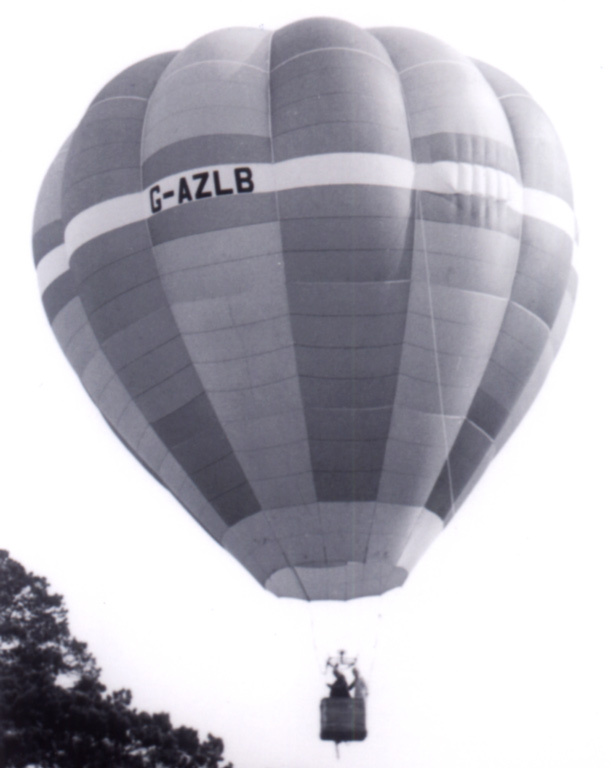 Julian adds, "this balloon had been in service for just a few months. It is easy to see why cylinder jackets soon came into fashion." This was the second Western built (ca. '70), which was, as of the mid-'90s anyway, still airworthy. Here is another early (and little!) Western still flying in the '90s (Collection of George Garcia Jr.), and here's another Western, a Swedish entry in the '73 Worlds. 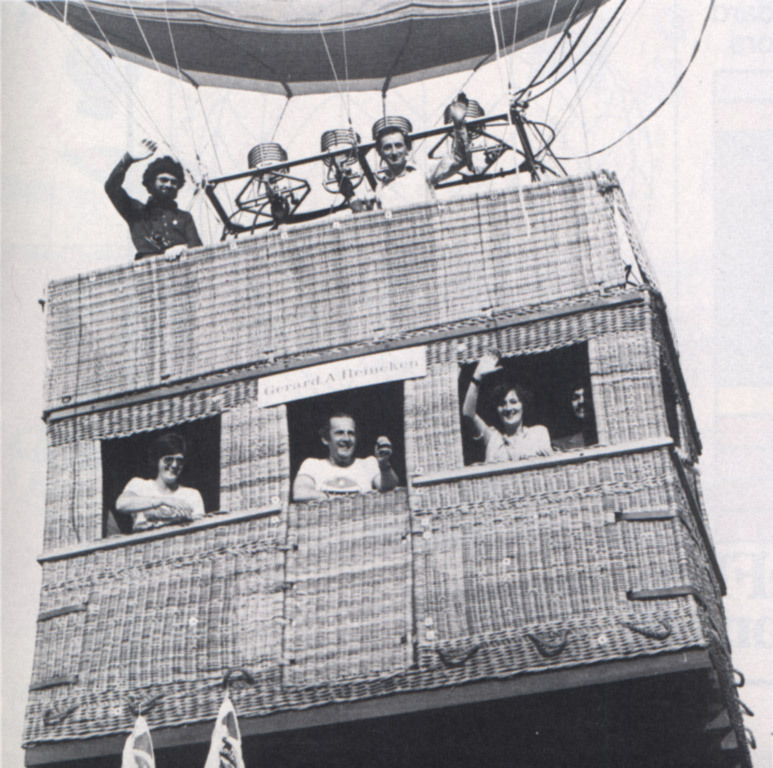 In the mid-'70s the "Gerard A. Heineken" was the largest balloon in the world, and sported this 2-story basket (yes, that's Don Cameron on the upper deck, right). 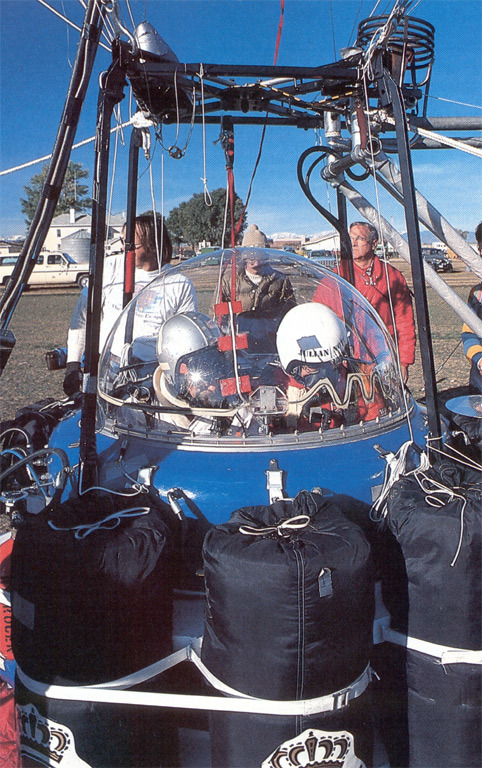 In 1980, Julian Nott piloted this capsule (under this balloon) to a world altitude record of 55,134 feet. Note the auxiliary burner at the top right, none other than the selfsame burner from Henry VIII, depicted above a decade earlier. 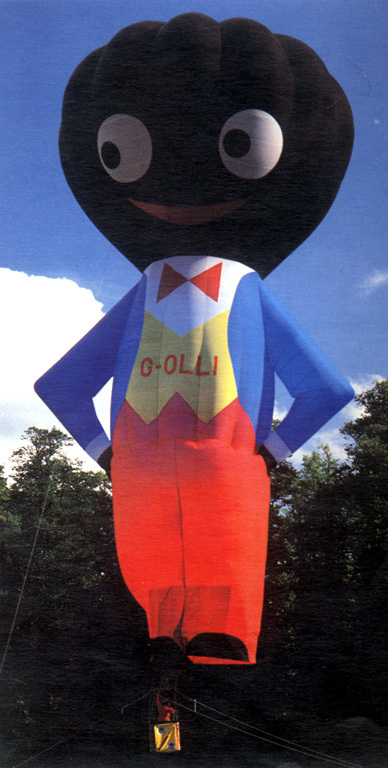 It's hardly difficult to find pictures of Golli III on the web, but the first shape balloon (1976) does bear mention (Here's another angle). 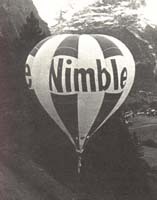 Cameron spurred along the low-cost-balloon craze with the Viva. Production began in 1976. This is a '77 model. Although long associated with bulbous gores, Cameron has long done a brisk business in flat balloons, like this N-Series, as well (note the Raven Rally's "me-too" skirt-to-scoop conversion). 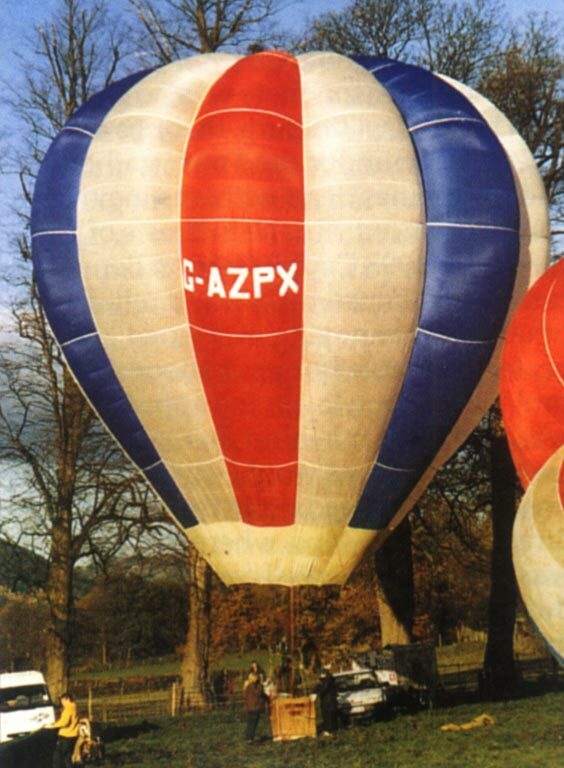 Cameron's first smooth-gored balloons, the S-Type, were not quite as advanced as the later N-Series. The S-Type was "not recommended for general use as fabric stresses are higher." This ad touts a few of Cameron's mid-'70s achievements, including the largest balloon in the world (a record the company broke several times), an innovative solar balloon, and the first hot-air airship. The S-Type ad at left is excerpted from this as well. 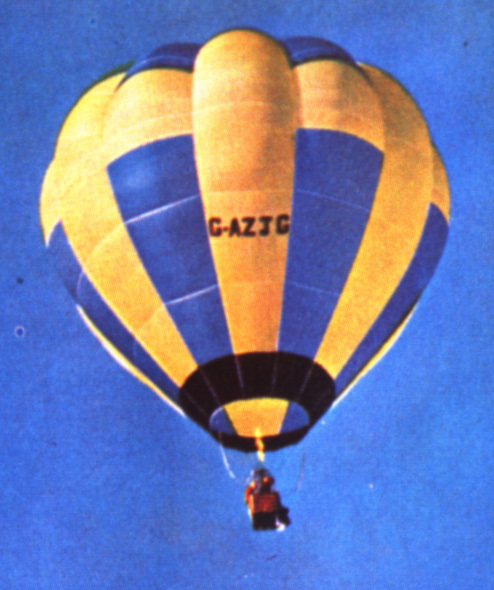 By 1979, Don Cameron had ample reason to smile - his company was thriving - having its most productive year in its history, as ballooning surged worldwide (note the "flexi-rigid" fiberglas uprights, sheathed load cables, and burner looking just a bit ahead of its time). Many thanks to Peter Bish, David Barker, Hannah Cameron, Alan Noble, Julian Nott, Richard Bowater and Richard Cardy for their much-needed contributions of images and words. Extra-special thanks to Lance Terry, for the loan of his '78-'81 Ballooning magazines, to Glen Moyer, for the generous permission to reproduce images from Ballooning, and to George Garcia Jr., who has allowed these pages to host many images from his vast collection.